People who work in an office often spend plenty of time sitting in your office chair- a position which can add a great deal of pressure and stress to the different structures in the spine. Because of this, you’ll need to find the best ergonomic office chair in order to prevent developing back problems or worsening pre-existing conditions. It’s crucial that you choose an ergonomic model and one that promotes good posture and supports the lower back. There are several models on the market to choose from, offered in a number of price ranges, which can make it difficult to find the right one. You can easily learn more about a model’s pros and cons by reading ergonomic chair reviews and find out what consumers had to say regarding a chair’s comfort and quality. Any professional who works in an office will tell you that their work experience, not to mention how much they get done in a day, can be majorly effected by the comfort or lack of comfort of their office chair. At one time or another, we have all felt lower back pain from sitting too much. It’s the toll of today’s work demands. When searching for the right model, there are several characteristics an ergonomic chair should have and features to look for. The seat height on a chair should be easy to adjust and a pneumatic lever is the easiest way to do this. Seat height ranges from sixteen to twenty-one inches from the floor, which tends to work for most people. This will allow the user to keep their arms even with the height of the desk and their feet flat on the floor and the thighs will remain in a horizontal position. The depth and width of a seat is also important. The seat will need to have enough depth and width to support the user comfortably. Typically sixteen to twenty inches of width is standard. The depth of the chair, measuring from the front to the back of the seat should be enough that a user is able to sit with their back remaining against the backrest of the chair. This should leave three or four inches between the seat of the chair and the back of the knees. The backward or forward tilt of the seat must also be adjustable. In an ergonomic chair, lower back support is crucial. The spine features an inward curve, which means that sitting for an extended period of time without adequate support for the lumbar curve can result in slouching, resulting in straining the structures in the spine. Ergonomic chairs must have a lumbar adjustment so the user can get the right fit to support their back. The average backrest on an office chair should be about twelve to eighteen inches wide. The backrest should be adjustable in angle and height if the seat is separate from the backrest. The backrest should provide proper support to the spine, with extra attention paid to the lumbar area. If the backrest and seat are one piece, the backrest must be adjustable in back and forward angles and should come with a locking mechanism which works to secure the backrest from reclining too far back once the user has chosen the appropriate angle. The material that’s used on the seat and back of the office chair should have enough padding to allow the user to remain comfortable for several hours at a time. We recommend choosing a chair that comes with breathable material, which can keep you cool. The armrests must also be highly adjustable and should allow the user’s shoulders and arms to rest comfortably. The forearms should not remain on the armrest as you type and the lower arms and elbows should rest lightly. Any ergonomic chair should rotate easily, allowing the user to reach different areas of their workspace without straining. A kneeling ergonomic chair has no back and places the user in a type of modified kneeling position. 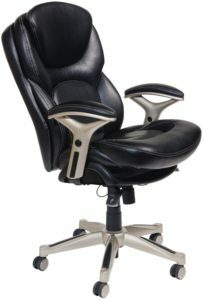 This kind of chair will promote correct posture by aligning the back, neck and shoulders and sliding the hips forward. The main source of support from this style comes from the seat, with additional support for the shins. This kind of chair also distributes the weight of the user between the knees and pelvis, which helps to minimize compression on the spine, reducing the tension and stress in the legs and lower back. This ergonomic style features a forward-slanting seat that provides a more comfortable position for the spine. 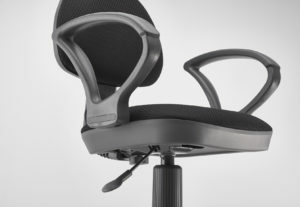 The saddle ergonomic chair is often used in place of the traditional computer or desk chair. this model comes in the shape of a horse saddle and puts the user in a position that’s somewhere between standing and sitting, kind of like the position a person would be in when riding a horse, allowing the legs to naturally widen and drop, creating a more stable position. This type of ergonomic chair is often recommended for people who suffer from chronic lower back problems. With ongoing use, experts believe that this style can actually work to strengthen the muscles in the back. The chair’s design is meant to eliminate some of the common problems people experience when using a traditional desk chair, such as poor posture and circulation issues. A reclining ergonomic chair allows the user to sit in a reclined position, which is often much more comfortable for the lower and upper back. These chairs are often highly adjustable and come with a variety of features that can allow the user to remain in their chair for a longer period of time. The chair mechanism controls how the back and seat move. This includes controls that are often levers under the seat that can be twisted, pulled or pushed in order to adjust the chair. Some chairs will offer more than one chair mechanism for the same chair. There are a couple of popular chair mechanisms. The first is the multifunction mechanism which is often preferred because of its wider range of adjustability. The seat and back angles can be adjusted independently from each other and the tilt. This kind of control allows the user to lock the chair into a number of different positions. A synchro tilt mechanism is the other popular option. The back and seat are linked and will tilt simultaneously as the user leans back. Because there is less adjustability with this type of chair mechanism, it’s not considered quite as ergonomic as the multifunction option. Chairs with this mechanism will feature a flexible front or waterfall front seat edge. The dynamic mechanism is a less popular option because it features a very simple design. When the user reclines the seat will move down and forward. This style of chair will recline instead of tilt and doesn’t usually feature tension adjustment. Because of the lack of tension adjustment, this style is usually counterbalanced to the user’s weight. The knee tilt mechanism will rock and tilt from just under the knees. The type of mechanism can provide maximum recline when combined with an independently adjustable back angle. If you’re considering a chair with this type of mechanism, make sure it comes with all of the other necessary adjustment features. Often this style may be missing back angle and height adjustment in addition to seat depth adjustment. 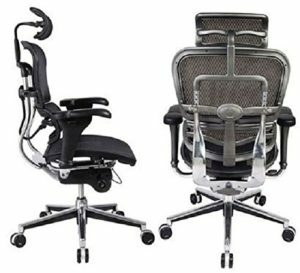 The task chair mechanism is considered the most basic and because of this, adjustments are often limited to seat depth and height. This type of mechanism doesn’t offer tilt because it tends to discourage movement. Of course price will be a major factor when it comes to the type of chair you decide to buy. And often, consumers make the mistake of purchasing the cheapest ergonomic model they can find in order to save a few dollars. But really, chairs sold for under a hundred dollars will only last you a year, if you’re lucky. And during that year you’ll quickly notice that the cushioning and functionality of the chair has taken a dive. 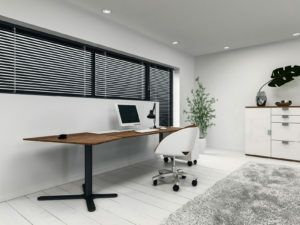 Instead of purchasing a new chair for your office every year it makes sense to look at buying a new chair as an investment of sorts and one that can have a major impact on your productivity and comfort. 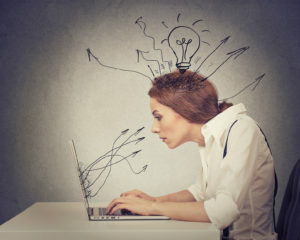 It can also have an effect on how you feel while you’re working. If you’re tired of the constant aches and pains and the ongoing lower backache, take a look at the pricier models that feature an extensive product warranty. These chairs are designed to last for several years and are highly customizable, working to ensure that the chair is adjusted to your specific body type and comfort needs. Regardless of the type of ergonomic chair you choose, short breaks should be taken once an hour throughout the day in order to improve circulation. Getting up from your chair this frequently can also relieve eye strain, encourages stronger posture and reduces fatigue. Purchasing the best ergonomic chair will be the first step in making your workspace ergonomically correct, but there are also other things you can do. First, make sure that your arms remain at a ninety degree angle with the wrists kept straight as you type. The monitor on your desk should be placed at eye level. This can be accomplished by using a monitor that has an adjustable arm. You should also make sure that you sit at least twenty-six inches away from the monitor. If you primarily work on a laptop, you should consider buying a separate keyboard tray, keyboard and mouse to ensure that you have your keyboard and monitor at the right height. Always avoid using just one light source because it can tire the eyes and try to avoid glare as well. You can also purchase an adjustable height desk, which will allow you to switch between sitting and standing throughout your work day. This can help to promote circulation. By purchasing an ergonomic desk chair and following these ergonomic guidelines you can improve your productivity and health and you’ll also be more comfortable. If you have to be stuck behind a desk all day, you might as well enjoy it. This Ergohuman ergonomic office chair features a high backrest and metal frame that’s covered in a polyester mesh that’s designed to promote air circulation, keeping you cool and dry throughout the day. This chair is highly adjustable, working to meet the contours of your body while taking a ton of stress and tension off your back. The lumbar support is outstanding and the overall quality of the chair is one of the main reasons it’s constantly out of stock. A model that received a high consumer rating, you’ll love the variety of features and style this chair has to offer. 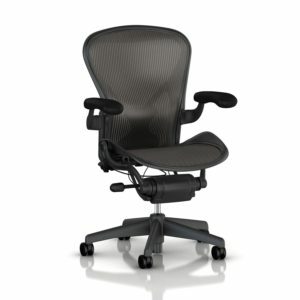 The Herman Miller Aeron task chair is our top rated product and one that has a lot of style and functionality to offer. Considered an iconic ergonomic office chair, this popular model features a stylish modern design and a number of adjustable features that essentially allows the user to get a custom comfortable feel from their office chair. The chair’s seat and backrest are designed with a strong, light mesh that works to mold to the body while also promoting air circulation, keeping the user cool. The Serta Back in Motion ergonomic chair features a layered body pillow design for ultimate comfort. It also features hand sculpted arms and softened bonded leather, for a modern look that will complement any workspace. It also features an innovative tilt seat technology that can prevent tension and stress to the spinal structures. Designed with affordability in mind, the Back in Motion chair is one of Serta’s top selling ergonomic models.